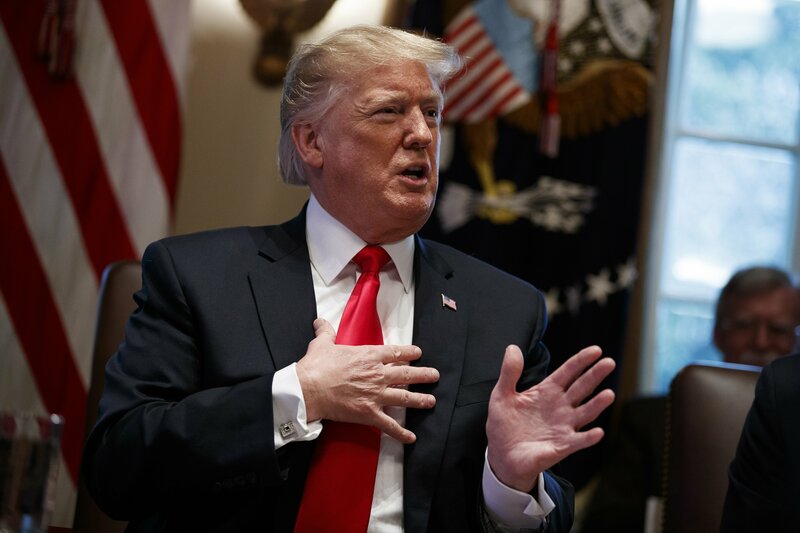 WASHINGTON — Home alone no more, President Donald Trump had a lot to share when he convened a rambling Cabinet meeting on Day 12 of the government shutdown. The president, eager for company after a lonely stretch in a near-empty White House, zigzagged for more than 90 minutes from his demands for a southern border wall to his thoughts on Kanye West and his decision to pull troops out of Syria — all while a mock movie poster with his photograph and the words “SANCTIONS ARE COMING, NOVEMBER 4” sat, without explanation, in the middle of the grand Cabinet Room table. It was Trump’s first public appearance in nearly a week, after being holed up in the White House for Christmas and New Year’s. Trump had been scheduled to spend the holidays with his family at his private Mar-a-Lago club in Palm Beach, Florida, but canceled the trip to wait out the partial government shutdown that began Dec. 22. “You know, I was in the White House all by myself for six, seven days. It was very lonely. My family was down in Florida,” Trump recounted. He described channel-flipping and watching a different network — PBS — to fill the time. “I felt I should be here just in case people wanted to come and negotiate the border security,” Trump explained. “I was all by myself in the White House — it’s a big, big house — except for all the guys out on the lawn with machine guns,” Trump said, referencing the Secret Service and military personnel who guard the White House year-round. It had indeed been a slow holiday stretch, minus a flurry of presidential tweets. The White House did not send out a formal public schedule; the doors to the White House press shop were often locked; and West Wing offices sat dark as Christmas and New Year’s ticked by. He also took a shot at his former defense secretary Jim Mattis, who resigned last month, saying he wasn’t happy with the job Mattis had done in Afghanistan. As the meeting stretched past the hour mark, Cabinet secretaries shifted in their seats as they took their turns speaking. At one point, Energy Secretary Rick Perry appeared to be playing mock piano on the arm of Small Business Administrator Linda McMahon’s chair. “It’s going to be a very exciting year. I think it’s going to be a very good year. Some people think it’ll be controversial and tough and it probably will, but we’re going to get it done,” Trump said.